As a symbol of heritage, honor and national pride the Proper Disposal of the American Flag is mark of solemn respect for all it symbolizes. 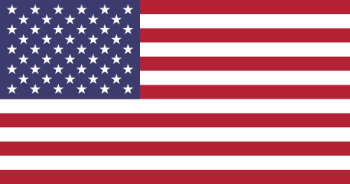 Instructions and guidance for the proper disposal of American flag are detailed in this article. The importance of the Stars and Stripes is reflected in the celebration of "Flag Day" on June 14 commemorating the anniversary of the original adoption of the Stars and Stripes as the official emblem of the US on June 14, 1777 and in the celebration of Independence Day on the 4th of July commemorating the USA declaring its independence from Britain. The proper disposal of American flag is taken extremely seriously by Americans. "The Flag, when it is in such condition that it is no longer a fitting emblem of display, should be destroyed in a dignified way, preferably by burning." Proper Disposal of the American Flag: It is vital that "No disrespect should be shown to the American flag of the United States of America". 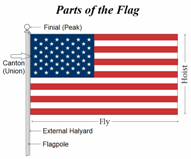 The American flag should never be fastened, displayed, used, or stored in such a manner as to allow it to be easily torn or damaged in any way. A torn flag may be mended, but a worn or tattered flag should be destroyed when it is no longer fit for display. Plan a private ceremony - the backyard would be appropriate for a retiring ceremony, but you should check to ensure there are no burning restrictions in your area. Ensure that the fire has reach a temperature that is hot enough to incinerate the entire flag, but not so intense that it may blow debris out of the fire.